Quite often small NGO’s such as ours, operate with limited funding and it’s only through the passion, generosity and belief in what we are doing in Laos, that we are able to raise funds with our supporters’ generous help. A great example of this was our 2nd annual Wardrobe Revamp Sale. 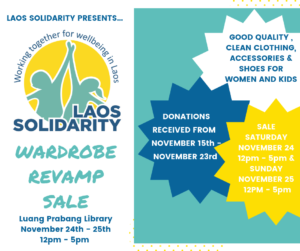 This year we held our sale in the Luang Prabang Library, who we partner with for our work with local children, teens, educators and women. 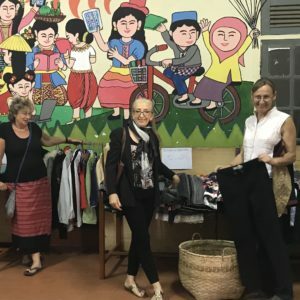 The sale is an opportunity for locals and expats alike, to donate good quality, clean, wearable clothes which they no longer need and allows others to purchase these at an incredibly reasonable price, while also being able to revamp their own wardrobe. 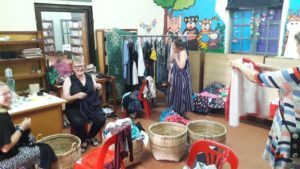 Any clothing that does not get sold and is appropriate for the villages in rural Laos, is then donated to local families in need. To be frank, in the days preceding the event we were a little nervous that we were not going to receive enough donations to raise the funds required to run revision workshops but, as is often the case, on the Friday prior to Sale day, we were overwhelmed. 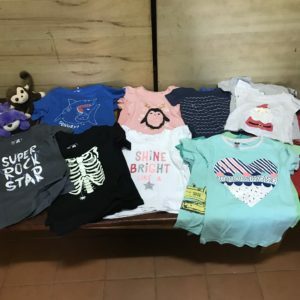 Not only did dozens of bags arrive from generous locals and expatriates but we also received an anonymous donation of 50 brand new children’s t-shirts for boys and girls, ranging in size from 2-12. Whoever you are, we thank you. They were an enormous hit – particularly the glow in the dark skeleton ones! Friday afternoon was spent sorting clothes into type, style and gender (yes, we even received a small selection of mens’ clothing). It was overwhelming for myself and a wonderful volunteer Nauka. 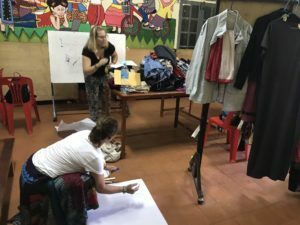 Surrounded by piles of dresses, sinh (traditional Laos skirts), trousers, tops…well you get the picture…we also had to set up our changing room, create our outdoor advertisements and keep the very curious local kids out of the room. There was ample curiosity as to what the two Falang (foreigners) were doing and I think the girls particularly just wanted to come in and play dress up (I know we did too). The morning of the sale started early for Sally, myself and our two wonderful helpers, Christine from Queen Design and Nauka. With the sale doors opening at 12 we had more pricing and sorting to finalise and if truth be told, a little shopping of our own to do. 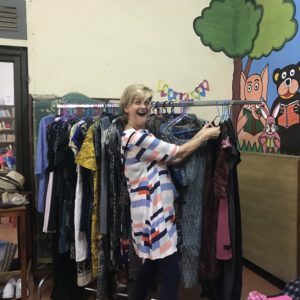 With an incredibly kind donation of a large clothing rack from Lisa of Ikon Bar in Luang Prabang, we soon realised that a) we had so many beautiful dresses donated and b) we did not have nearly enough coat hangers to display them. In a show of collaboration with the team from the Luang Prabang Library, the delightful Madam Chanthany took herself off to the morning market and negotiated a Lao price for an additional 30 coat hangers (on top of the 40 we already had). Day 1 was a roaring success. When we finally opened the doors at 12, things started to move quite quickly. With our very own personal stylist on hand (Christine Boyle, from Queen Designs), she soon had customers trying on and purchasing clothes for all occasions. As Whitney, one of the local expatriates said “Shopping is usually an activity associated with a little bit of guilt. Shopping for a wonderful cause, removes the guilt” for Whitney, she was simply “…happy to be part of a fun morning and to contribute to a great cause”. Day 1 raised enough money to run a puberty hygiene session at a school for teens and although day 2 was a little slower, we managed to raise enough to run a rural community hygiene session in the Northern mountains of Luang Prabang province. The sale attracted expats, locals, backpackers looking to refresh their wardrobe and of course the kids who attend the library – many of whom we gave clothes and accessories to. In addition, all of the clothes that were not sold, will now be taken to our rural educators and distributed to the communities in need that we work with. With all said and done, it was an enormous success and many people will benefit from the local community’s generosity. Thank you Luang Prabang.